← BREAKING NEWS! The Black Series [Star Wars 40] 6" Line: It's Done Folks! Star Wars Forces of Destiny,” an original series of animated shorts which explore the untold stories that helped shape the destinies of Rey, Jyn Erso, Princess Leia, Sabine Wren, Padmé Amidala, Ahsoka Tano and others, will make its debut beginning on July 3rd on YouTube.com/Disney. A new short will premiere online each day at 10am PST, culminating with their broadcast debut on Disney Channel, Sunday, July 9th. 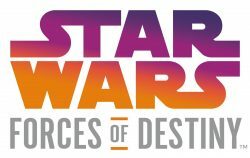 “Star Wars Forces of Destiny” will also be supported by global product extensions such as books, apparel, bedding, as well as Hasbro adventure figures & role play items available beginning August 1st. Click through for a look at the trailer. Previous Article: BREAKING NEWS! The Black Series [Star Wars 40] 6" Line: It's Done Folks!